Everything seems to be getting smarter these days–We have smart phones, smart computers and now we have “smart skin.” Thanks to a group of researchers at Seol National University, prosthetics have gotten a whole lot smarter with smart skin. This month Nature Communications released an article that details a new advancement made in the area of prosthetics. A team of South Korean and U.S. researchers, have developed a polymer that can mimic the stretching and sensing capabilities of human skin. Due in part to the great strides made in both the areas of prosthetics and nanomaterials in recent decades, we have now been brought closer than ever to achieving more realistic prosthetic limbs that can not only move based off of a user’s nerves and muscles, but can actually relay sensation to the wearer. of temperature, pressure, and nerve stimulation sensors. What’s more is that in an effort to make the skin even more realistic the researchers have added a layer of actuators that raise the temperature to that of normal human body temperature. They also used motion capture cameras to view how the hand moves and stretches to apply the silicon shapes to accommodate stretching. 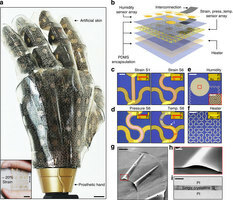 Dae-Hyeong Kim, who led the project at Seoul National University, connected the smart skin to a rat’s brain in order to demonstrate the new interfaces capabilities. The demonstration measured reactions in the animal’s sensory cortex to sensory input. More work is needed, however to show whether, or to what extent, the rat was actually feeling temperature, moisture and pressure. While this smart skin addresses the long standing problem of adding sensation to prosthetic devices, there still exists an even larger issue–How can we create concentrated and long lasting connections to the human nervous system, so that the wearer can actually “feel” what’s being sensed? New Nano-Structure Serves Dual Purpose: Diagnose and Treat Cancer Tuning Graphene’s Nature Nano-worms to the Rescue Nano-Structures are the Future of Water Repellency New Sensor – 1000 Times More Sensitive to Light!